And then there were 10, as in only ten bouts that will make up the “UFC 142: Aldo vs. Mendes” roster. 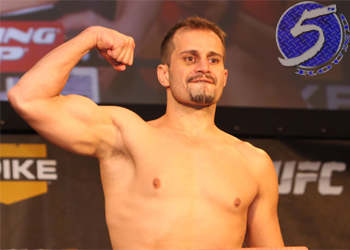 The world’s premier mixed martial arts organization announced an undisclosed injury has forced Fabio Maldonado (Pictured) out of Saturday’s contest against Caio Magalhaes. With only five days remaining until showtime, UFC matchmaker Joe Silva has decided against trying to locate a last-minute replacement to face Magalhaes and will scrap the bout altogether. The HSBC Arena in Rio de Jenairo, Brazil hosts this weekend’s fiesta. A featherweight title bout between champion Jose Aldo and Chad Mendes headlines the pay-per-view broadcast, which airs live in North America at 10PM ET/7PM PT. Vitor Belfort welcomes Anthony Johnson to the UFC’s middleweight division in the card’s co-featured contest.